China said it was investigating "in a very responsible manner". China-US relations have been strained recently, amid fears of a trade war. The state department said it was taking the incident "very seriously", but the US has not accused China of being behind it. In a separate move, the US has rescinded its invitation to China to participate in the forthcoming Rim of the Pacific naval exercise, which brings together the military forces of more than 20 countries. He said there was strong evidence China had deployed anti-ship missiles, surface-to-air missile (SAM) systems, and electronic jammers around the contested Spratly Islands. 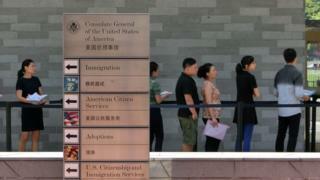 Embassy spokeswoman Jinnie Lee said the employee had suffered a "variety of physical symptoms" between late 2017 and April 2018 while working at the US consulate in the city of Guangzhou. The employee was sent back to the US, and on 18 May the embassy learnt that they had been diagnosed with mild traumatic brain injury (MTBI), Ms Lee added. "We do not currently know what caused the reported symptoms and we are not aware of any similar situations in China, either inside or outside of the diplomatic community," the US diplomatic statement said. The statement continues with a warning: "While in China, if you experience any unusual acute auditory or sensory phenomena accompanied by unusual sounds or piercing noises, do not attempt to locate their source. Instead, move to a location where the sounds are not present." In a news conference with Mr Pompeo in Washington, Chinese Foreign Minister Wang Yi said Beijing would protect the lawful rights and interest of foreigners in China, especially those of diplomats. But he warned against the case being "magnified, complicated or even politicised". Was this a sonic attack? Parallels have been drawn with the suspected sonic attacks in Havana. Mr Pompeo told the House of Representatives Foreign Affairs Committee: "The medical indications are very similar and entirely consistent with the medical indications that have taken place to Americans working in Cuba." He added that medical teams were on their way to Guangzhou to investigate. "We are working to figure out what took place, both in Havana and in now in China as well," Mr Pompeo said. "We've asked the Chinese for their assistance in doing that and they have committed to honouring their commitments under the Vienna convention to keep American foreign service officers safe." He added there was nothing so far to link the China incident directly to Cuba. "We cannot at this time connect it with what happened in Havana but we are investigating all possibilities," a US embassy official in Beijing told AFP news agency on condition of anonymity. In November 2016, US diplomats based in Cuba started to complain of odd ailments, including dizziness, nausea and hearing problems. More than 20 members of staff in Havana were harmed in the "health attacks", according to the state department. At least two Canadians were also affected. The US has held Cuba responsible, either for allowing the suspected attacks to happen or for carrying them out itself. Cuba has denied any involvement, and described the reports as a "political manipulation" aimed at damaging bilateral relations. Cuba acoustic attack: What is a covert sound weapon?